There's more to mobile gaming than decapitating zombies, shooting aliens and driving endlessly round a track. Sometimes it's good to get the old synapses firing.Keep them fresh, keep them busy, and you'll be sharp when you hit your twilight years. Or, you know, just play them because they're tones of fun. Here’s our selection of our favorite Android puzzler for you to wrap your heads around. Today we’re going to talk about an awesome block puzzle tetris game called Block 1010. It is developed by EzOs, supports Android 4.0.3 and up, and can be played on both phones and tablets. The team managed to integrate colorful graphics and catchy tune that can engage you even more. The answer is pretty simple – Block 1010 is a simple, yet a challenging and addictive puzzle game that got us all hooked up. It offers a gameplay with tons of prizes, achievements, global leaderbord, an offline mode, and so much more. All you have to do is start it, drag and match pieces and fill any rows or columns in order to get high scores. There are different game modes as well: a Timeless mode, a Time Limit mode where you have to mind the time, and a Battle mode where you can play against other users. 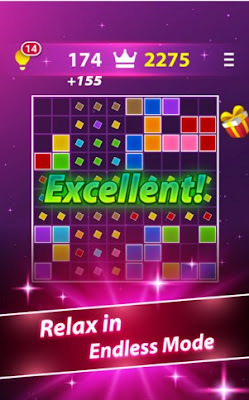 Block 1010 can be downloaded for free from Google Play – get it today and have endless fun!